Get ready kids! 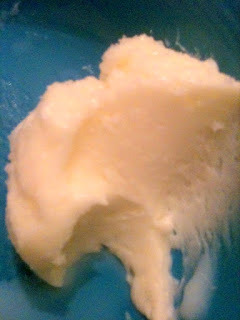 I have been teasing my kids for quite some time now that we would make homemade butter in class. We have been reading Little House in the Big Woods and they talk about real homemade butter. Butter is easily made from heavy cream and tastes really good. Several people brought in baby food jars for our project and I think we now have enough. Tonight I decided to do a "trial run" and make some to be sure I remembered how to do it. Tadaa! Lacie and I enjoyed the homemade butter on our bread tonight. It was delicious! Can't wait to do this in class. The only thing I think I will change is the baby food jars. Too much trouble! I think we will make it in a quart jar and pass around the shaking jar.